Well, this book form wild horse island is about a girl named Darbey. She goes to Hawaii & has to save a mustang filly! Where she also gets to meet her grandfather. I'm always happy to see readers enjoy my books & taking the time to tell others about them! This is the first book in the Wild Horse Island series which follows the adventures of a girl named Darby Carter and her adopted mustang, whom she names Hoku (Hawaiian for star). Darby Carter has loved horses her whole life, so when she hears she and her newly adopted mustang are going to stay at her grandfather's ranch for the summer, she's super excited. Even though she's never ridden a horse before going to the ranch, she's confident in her abilities to learn. But her grandfather's beliefs that horses are your business partners, nothing more, clash against hers that horses are friends as well as workers. But in time she accepts her grandfather's strict beliefs, as well as growing closer to the ranch and its inhabitants. I liked this book, and I would rate it three-and-a-quarter stars. This series is about Darby Carter, who goes to live with her Grandfather on a Hawaii Island called Wild Horse Island. Her wild, sorrel Mustang filly is shipped over; this filly was abused before, and while she trusts Darby to a point, she is skittish and hates men- to the point of kicking Cade one of the "hired hands" on Jonah's (Grandfather's) ranch in the chest and injuring him. So far the series is 11 books long, but It's still being written. Darby goes through a lot as she tries to tame and train her dream horse, whose name is Hoku, which is Hawaiian for "star". Many other horse related mysteries and life threatening events come up along the way, and all in all this series is very well written very fun to read. The author is Terri Farley, also the author of the original "Phantom Stallion" series. HI, Which of the books had to go back to the library? I'll be happy to email you & tell you the ending ;) Thanks for reading with your daughter! can anyone tell me what happened in the end? my daughter was about 3/4 through the story but had to return it to the library. I can't find a review anywhere and have to wait another month before I can re-check the book out! I have read the entire series of both books! is there really a real hoku? i love horses and i never stop thinking about your books! THANK YOU! i haven't read this book but i have read mist walker wild horse island i loved that book, so i'll rent this one! I absolutely loved this book! I definitely recommend it! I really want the second book and i'm asking for it for Christmas. The only downside is that I don't think they print them anymore, so they are hard to find. From the fourth book and up (you can find them all on amazon), it gets really expensive. One of them was $500 new on Amazon, but it's because I don't think they print them anymore. Other than that, I love this book! This book is one of the best I've read. And I read a LOT. This series has adventure, bond, and mystery. Darby Carter is a girl who loves horses but never had the change to ride one, living in Los Angeles. Her mom is an actress, and her father lives in Hawaii as a divorced man. But when Darby's mom had to leave home again to make another movie, Darby had 2 choices. Stay with dad on the Mainland, or meet her grandfather who owns a Quarter Horse ranch. A nice woman talked people into letting Darby own a wild Nevada mustang, when she lied down in the snow with a horse who got hit by a bus during the winter. The horse was shipped in while Darby took a flight from California to Wild Horse Island, Hawaii. Throughout the books, Darby and her mustang filly share a bond that gets stronger and stronger. They face difficult obstacles, like the volcano eruption, the tsunami, and bad guys. The series is a great way for any horse-lover to witness the bond between horse and human. Terry Farley definitely outdid herself in this great adventure called Phantom Stallion-Wild Horse Island. I love how Terri Farley used the same character from the last phantom stallion so she could connect the stories and keep writing. i also love how at the end of your descriptions you always leave a mystery, it makes me want to sit down and read more! also in school we had to do a report on our favorite book and i wrote about your awesome phantom stallion series and wrote the longest paper of all! it was your books that inspired me to do that i feel like i am right next to Sam, Jake and Jen on their wild and awesome adventures! of course i loved your wild horse island series a lot too but i couldn't resist writing about the original series as well. Darby saves a beautiful wild mustang filly's life and brings her to her grandfathers ranch in Hawaii. Darby names her Hoku. They create a special bond that no one can brake. Take my advice and read them, they are just so life like. it is so awesome i love it!!!!!!!!!!!!! I LOVE THIS SERIES!!! I GOT ALL OFF THEM FOR CHRISTMAS AND READ A BOOK EACH DAY. THIS SERIES IS THE BEST!!!!!!!!!!!!!!!! That book was sooooooo good! I only read up to #5, because the Westchester libraries don't have the rest. The libraries BARELY have ANY horse books! I really want to read some of the books on this site, but the library doesn't have ONE!!!!!!!!!!!!!! I think this series is great. The author uses lots of details to pull you in. I have read 1, 2, and 3, and want to read 4 really badly. For any person who likes horse books a lot, I HIGHLY RECCOMEND THE SERIES! I SO SO SO SOOO LUV THESE BOOKS!!! I HAVE READ BOOK #8,#7,AND IM HALF WAY DONE WITH #1! I love the books. I love the horses. I love everything, it really is a great book. I think everyone who loves horses( Which should be everyone who reads this. )should read this book. I have seen every other horse book out and this one is the best of them all. I love this series. Mostly because I LOVE horses and I LOVE Hawaii. Also, because it was well written. It is about a 13 year old girl, Darby, who moved from Los Angeles to Wild Horse Island, an island created by the author Terri Farley. Throughout the series Darby has many different "horsey" adventures with her sorrel mustang Hoku, meaning "star" in Hawaiian. 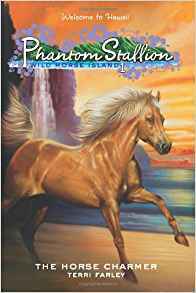 My favorite book of the series is the 11th book, Phantom Stallion Wild Horse Island: Faraway Filly. But I REALLY recommend you read the whole series! GUARDIANS OF GA'HOOLE by Kathryn Lasky. WARRIORS is about feral cats and GUARDIANS OF GA'HOOLE is about owls. This book is one from the Wild Horse Island series. It's about a 13-year-old girl (Darby) having adventures alone in the rain forest with her wild, ferocious fiery mustang filly (Hoku) that trusts no one but her. She goes with Darby through thick and thin, and protects her from dangers. Her wild instincts always lead her to safety. The book is most tasty when you have read #1 and #2 of the series (this is #3). W I C K E D !!!!!!!!!!!!!!!!!!!!!!!!!!!!!!!!!!!!!!!!!!!!!!!!!!!!!!!!!!!!!!!! I've got 2 of the book's they're awesome! I love Phamton Stallion Wild horse Island! I'm on the 4th one :D its like the best series ever!!!! I love the phantom stallion series too! I read the first phantom stallon series then started the second but I caught up to the auther on the fourth book. So I started the heartland series and haven't gotten back to it yet. But it is my favorite series so far. I am almost done with the Phantom stallion wild horse island series!!! i just finished book 4! Actually, um, horselover490, it's the same series... xD lol! I LOVE this book! I finished it, and I want the second one REALLY REALLY badly!! i've never read that series but i'm reading the phantom stallion series right now and i'm almost done it !!!! i don't want the series to end!! but i think i'm going to read this series next.